This used to be a very excellent and interesting thread. Just sayin'. The thread title starts with 'conservative'. What are conservatives (scientists, politicians, citizens) trying to conserve? If we want to conserve a livable planet, we'll need to take less risks with dumping carbon into the atmosphere. How is taking extreme risks with our climate and home planet conservative? Like they say: save the earth, it's the only planet with chocolate! Lennart - I cant really win here as the point was not about the models themselves but about their presentation. If I presented the lowest deviation from the lowest reading model I could find and said 'look Global Cooling' i would have a lot of abuse hurled at me quite rightly. The graphical representation of the RCP8.5 models was presented as if it was all the current modelling and therefore devious and unfair, thats all, I wasnt passing comment other than that. Great, let's have a beer to that! Beer, Beer best suggestion all night!! The word conservative can have different meanings to different people. I have great admiration for both Jim Hansen and Noam Chomsky, who both call themselves conservative. I was just giving my meaning of the term and trying to find out what we are talking about. It sounds like you are indeed trying to conserve the earth and a livable climate, so we're working for the same goal. We can still have different opinions, of course, but that's only natural. The 1.1 lowball estimate is based on paleoclimate analysis that is limited to ice age periods (they threw out the interstadial inputs because their models blew up). It is clear that current top of atmosphere energy imbalances make the 1.1 limit so completely untenable that its very presence within the body of the report is the most damnable indication of falsehoods and suppression of real risk messaging. There is no FREAKING way that it can possibly be 1.1 with .6C already happened, .7C locked in at current emissions and another .7C projected as soon as we reach ice free arctic summers. I have yet to see a real honest scientific argument that can honestly state 1.1 has any credibility. When a scientist buys into that argument without proof, I consider it to be akin to a tobacco industry executive testifying before the U.S. congress that he "doesn't believe that nicotine is addictive." I've already explained why Durack et al is more likely to mean a lower climate sensitivity not higher. No one has explained the flaw in my reasoning, but simply resorted to name calling. The lowball estimate for ECS according to IPCC is 1.5, not 1.1. It is not justified by paleoclimate analysis only, but is also supported by several observational studies. Currently the Co2 equivelant in the atmosphere is something like 480ppm, which is over 70% of a doubling. Add 0.6 to the 0.7 locked in and we are at 1.3. 70% of a doubling at 1.5 ECS would be at about 1 degree. That 0.3 degree difference could easily be due to a combination of some of the warming to date being caused by something other than Co2, or the 0.7 estimate of locked in warming being in error. As for the 0.7 increase due to an ice free Arctic - I call nonsense. When you make such basic errors, and then proceed to accuse scientists of fraud, I find that extraordinarily offensive. I am sorry, I must have missed that argument, re Durack et. al, care to provide a link/thread? The 1.3C of locked in warming is based on purely catching up to current top of atmospheric radiative forcing. It doesn't include feedbacks and also neglects to include current aerosol forcing which has a strong (temporary) cooling effect and reduces the 480 CO2 equivalent value significantly. I thought this was clear in my post. The locked in value comes directly from a lecture by James Hansen. If we consider these values from my post and current CO2 equivalent is about 400ppmv then we have ECS = (.7+.6+.7)/(400ppmv/560ppmv) = 2.8C So James Hansen was being conservative in his estimation. as I am busy just a short answer and some quotes from scientists, which do confirm that carbon cycle feedbacks from thawing permafrost and from increased decomposition of wetlands - be it CO2 or CH4 - are not included in the projections oft the IPCC, AR5. 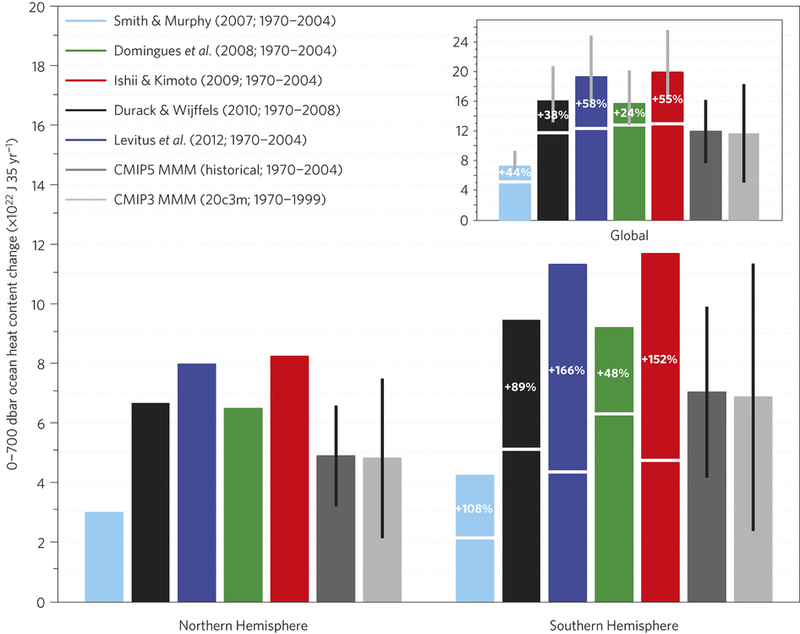 The permafrost feedback is not included in any of the CMIP3 or CMIP5 climate models. However, CO2 from permafrost does not contribute to climate sensitivity. Climate sensitivity is defined as “to the equilibrium change in global mean surface temperature following a doubling of the atmospheric (equivalent) CO2 concentration (IPCC glossary of terms)”. This definition specifically leaves out carbon cycle feedbacks. The climate sensitivity is determined by the direct radiative effect of CO2 and feedbacks from non-CO2 systems (ex. albedo, clouds, water vapour). quoted from here http://www.skepticalscience.com/Macdougall.html, comment 5. It has been confirmed by several climate scientists that I have written/spoken to. The first comment I received was this one (Reply 21 from the link above). there is a distinction between processes that have been diagnosed offline from GCM projections (such as forest fires and permafrost melt), and those that are already fully inside GCMs, providing feedbacks to climate. The AR5 GCMs typically didn't include fires or interactive methane emissions from permafrost and wetlands, but many models will include such feedbacks next time around. So from this, it seems pretty clear - at least to me - that CO2 and CH4 emissions from Permafrost and Wetlands are not included in the temperature and SLR projections of the current IPCC report. From my reading the emissions are included in the temp and SLR projections - and the feedbacks are not. That is a fixed amount of CH4 from permafrost is included in RCP pathways which is not calculated within the model but imposed from the RCP. So the CH4 from permafrost is there, but will not increase under high warming or decrease under low warming, but it is different from one RCP to another. Ahh I see, ok I found the "explanation" you wrote on why Durack et. al means lower ECS. A greater amount of heat content increase in the southern ocean does not immediately imply a higher climate sensitivity. In particular it does not guarantee that the total heat budget of the earth needs to increase. The total heat budget of the earth must match the top of atmosphere radiative imbalance. So perhaps our estimate of the TOA radiative imbalance is wrong and needs to be increased. Or perhaps the heat budget elsewhere is wrong and needs to be changed to balance the books. In particular the aerosol component is highly uncertain and when church et al attempted to work out the heat budget they calculated the aerosol component as the residual when other facts were taken into account. So what if the aerosol component is wrong? In that case an increased amount for the ocean heat flux would imply a smaller residual (see figure 3 of church et al) and a smaller value for aerosol cooling. This would then imply a lower value for climate sensitivity, and not a higher value. I glossed over it because it was not an argument but rather conjecture, based on a fundamental misunderstanding of Durack et. al and the physics involved. However, Durack et. al found that the models correctly tracked ocean heat accumulation in the Northern Hemisphere, the revision to heat accumulations were from the southern oceans only. This then implies that the impact of the anthropogenic aerosols are UNDERESTIMATED (potentially severely) since the impact of aerosols are felt overwhelmingly in the northern hemisphere. It should be noted here that the uncertainty for aerosol emissions have a very fat tail, especially secondary cloud effects. It also implies then that jet contrails may also be a negative forcing, not a positive one as currently modeled (if the aerosol effect is much more negative than currently expressed in the models). If a significant portion of the southern ocean underestimate of heat accumulation is due to the higher aerosol and contrail cloud effect negative radiative forcing, then the ECS will be revised higher, potentially much higher (by 30% or more). I'm not angling Neven - on checking I'm wrong with the source - the one i refer to is the '73 CMIP5 RCP8.5' models and observations. FYI mark, that sceptic graphic has been thoroughly discredited. Not only do they use faulty satellite data that is contaminated with upper atmosphere cooling signals and skewed by satellite orbital decay and poor coverage of arctic warming. but, as neven implied, they also cherry picked the CMIP5 runs. In contrast the aerosol component of the energy balance is uncertain, and Church et al calculates it by taking the measured top of atmosphere imbalance and subtracting the other components. Therefore Durack is most likely to imply a reduced aerosol cooling component. I did state a lower equilibrium sensitivity but some more thinking I'm not sure about that part. I think the total picture would be less current aerosol cooling means less current co2 warming, but more heat captured by the ocean would mean more lag on the co2 warming so that equilibrium sensitivity would remain the same, but we'd get there slower. TOA are also well documented, although inherently less accurate with an uncertainty of ±4 Wm–2 on the net TOA flux that mostly stems from calibration errors on measurements of the outgoing fluxes12,15. This uncertainty is almost an order of magnitude larger than the imbalance of 0.58 ±0.4 Wm–2 inferred from Ocean Heat Content information13,14. in other words, the calibration error from the satellite readings is higher than the expected TOA value. In church et. al. they use calculated forcings taken from other authors to determine total forcings and then subtract the heat inventory to get the residual. the time-integrated cooling due to tropospheric aerosol (and any unidentified forcings) is inferred as the time-integral of the other forcings (well-mixed greenhouse gas, solar and volcanic) minus the sum of the heat storage and the time-integrated climate radiative response, and amounts to 800 × 1021 J (Figure 3a and Table 2) [716 for 1972–2008, 815 for 1961–2008]. None of the sources used satellites to determine the forcing, indeed portions of the calculation occurred before the satellite era. You did not mention that the extra heat accumulation occurred solely in the southern hemisphere. . . However, there are other uncertainties such as Total GHG radiative forcing effects. If this value is much higher and the aerosol and cloud-effect components are more negative then this would produce accurate models in the northern hemisphere but higher than modeled heat accumulations in the southern. In this environment a given GHG abundance produces a much higher forcing value, therefore this pushes the most likely ECS value much higher (by upwards of 30%). Is this what we are seeing today? Sorry. I find the Church et al paper to be tricky and confusing - it seems to be written for people who have a lot of background knowledge about the whole heat budget issue. So I tried to find a paper that gave a simpler answer without noticing the size of the uncertainty. The rate of storage of heat by the climate system equals the net heat flux into the climate system N = F − λΔT, where F is the radiative forcing, ΔT is the global averaged temperature change and the climate feedback parameter λ is assumed constant over this period (but see discussion below). This parameter is inversely related to climate sensitivity to a doubling of carbon dioxide, ΔTeq = 3.7 W m−2/λ. Murphy et al. used a regression of N − F, with N determined from satellite radiative flux data from the ERBE and CERES missions, against the global averaged temperature change ΔT to make an observational estimate of the climate feedback parameter. That is the net heat flux into the climate system is determine as a combination of satellite measurement, forcing data and temperature change history. It is not determined by adding up the heat accumulation in each component as your argument maintains. That is not relevant as ocean currents and wind etc can move heat around - the heat does not have to be stored in the same hemisphere as it originally is collected. Yes, but how fast can this heat be substantially moved around between the two hemispheres? Perhaps someone who knows what he is talking about could help us out here? In the meantime I have gathered more sings which do indicate that CO2 and CH4 from permafrost and wetland changes are not included in the RCPs and the AR5 projections. The blue colored curves show the lower and upper limits of CH4 emissions from RCP 2.6 and RCP 8.5. The emissions from Wetlands will (may) double in the next 100 years, permafrost CH4 just gets a short mention but it would add a significant amount of CH4 to the budget, for all scenarios but RCP8.5 it would double the RCP emissions. Of course this are only the CH4 emissions, the estimate for the CO2 and CH4 emissions from the PCF alone is about 100 PgC equivalent (AR5, p. 531). If my math is right, that equates to 366 Gt CO2 equ. - a whopping third of the remaining carbon budget for a fifty percent chance of limit the warming to 2 C (around 1.100 Gt CO2 or 300 Gt C if we account for non-CO2 gases, see for instance Summary for policymakers p. 27). Which finally leads me back to the topic of this thread. While, from a scientific viewpoint, there are good reasons for not yet including the carbon feedbacks (a lack of sufficient and coherent understanding of the exact processes and the magnitude - p. AR5, chaptre 12.5.5.4 Permafrost Carbon Storage, p. 1116), for me this issue should have been stressed much stronger in the Summary (but I am sure there were strong objections from the ff burning kings). A lower warming target, or a higher likelihood of remaining below a specific warming target, will require lower cumulative CO 2 emissions. Accounting for warming effects of increases in non-CO 2 greenhouse gases, reductions in aerosols, or the release of greenhouse gases from permafrost will also lower the cumulative CO 2 emissions for a specific warming target (see Figure SPM.10). "Limiting the warming caused by anthropogenic CO2 emissions alone with a probability of >33%, >50%, and >66% to less than 2°C since the period 1861–1880, will require cumulative CO2 emissions from all anthropogenic sources to stay between 0 and about 1570 GtC (5760 GtCO2), 0 and about 1210 GtC (4440 GtCO2), and 0 and about 1000 GtC (3670 GtCO2) since that period, respectively. These upper amounts are reduced to about 900 GtC (3300 GtCO2), 820 GtC (3010 GtCO2), and 790 GtC (2900 GtCO2), respectively, when accounting for non-CO2 forcings as in RCP2.6. An amount of 515 [445 to 585] GtC (1890 [1630 to 2150] GtCO2), was already emitted by 2011." "The release of CO2 or CH4 to the atmosphere from thawing permafrost carbon stocks over the 21st century is assessed to be in the range of 50 to 250 GtC for RCP8.5 (low confidence)." So 790 GtC - 515 - 150 = 125 GtC carbon budget left for about a 66% chance of staying below 2 degrees C. Or not? Until the year 2100, up to 250 PgC could be released as CO 2 , and up to 5 Pg as CH 4 . Given methane’s stronger greenhouse warming potential, that corresponds to a further 100 PgC of equivalent CO 2 released until the year 2100. I have no idea, where this difference comes from - perhaps the 100 PgC is a mean of all RCPs? Jai with ref to your 39490 message a while back - that was my point. Thats why I picked that representation (I thought I explained that) as it was a complete deception and also why I wont post it here - it made me really angry, but whats the point I've been 'labelled'. Yes I do consider myself a conservative - I took to trying to convince sports grounds to take on an alternative way of feritlising other than reliance on Haber Bosch produced nitrogen that produces 1.92t of carbon dioxide to every tone of ammonia. Half the nitrogen in your body has come from that process, 1 - 2% of the entire industrial energy is used in that one process, 30% of humanity is sustained by that process - its truly awful its an incredibly energy reliant process. Everyone I talked to thought moving away from it - especially as it wrecks the microbiology - was brilliant, however so tight is the hold of the big chemical companies that when it came to it very few would take the risk. Net result I went bust, so now I am 'conservative' in my outlook - I cant take the risk of doing that to my family again. I dont like bringing it up, I dont want sympathy, but I really resent the inferences that being conservative means I dont care. Due to circumstances I am risk averse........conservative. Please leave it at that, its now twice I have said it. I understand what you are saying. I misunderstood your contextualization and assumed you were speaking from an ideology not communicative philosophy. with regard to the topic of "conservative" vs. "alarmist" and the communication of science. One must first always realize that the process of communicative discourse requires thesis, antithesis and synthesis. In this regard, the polarization occurs due to the imbalance between authentic and inauthentic poles. The authentic pole is the scientific one that vainly seeks to maintain credibility within an exhaustively self-critical analysis process. Then, external to the scientific community the "message" is communicated to the public. In an attempt to remain credible to the public the internal strategies are reflected in their external findings. That is the "soft" communication approach. The inauthentic pole is a network of PR agencies who have been hired by fossil fuel and agribusiness companies which seeks to draw down the synthesis response away from any support for action that might impact those companies' income streams. Their efforts are expressed in deception and exaggeration, even 'dirty tricks' such as hacking emails from climate scientists and mischaracterizing the discussions into soundbites and paying complicit news organizations to promote their story line. They also generate deceptive graphics such as this one which was seminal in creating a core group of misinformed idealogues who are (now) heavily invested denialists. usually this image is combined with a small arrow that points to the warming at the tail end of the record and declares that is the modern period warming. This is just an example of the "gish gallop" of lies and obfuscations perpetuated by this highly entrenched and well funded system of propaganda dissemination that works as the anti-thesis to the scientific community's message. within this realm then, the inherent conservatism of the scientific community works to soften their position and allows the final synthesis of the two messages to work in favor of the propagandists (who absolutely don't care if they are proven to be lying, but simply move on to the next lie, realizing that the message is all that matters). To properly counterbalance this effort, skeptical science has, perhaps done the best job. However, there is no way that a few websites can counterbalance the entire corporate controlled media empire and their intentional distortion of the scientific truth. So, the only real solution is to have an analog response generated by an international alliance of scientific and professional organizations. An "uberspecht" That can announce from the highest possible tree a constant rapport of alarm, one that continually shows what the real 33% probability of risk looks like and what we need to do to give us a better chance for survival. The IPCC set the stage for this, now it takes an independent body of "counter propaganda" to oppose the industry PR groups. This is a good example of the PR strategy of distortion and denial. We are talking about ocean heat. Since the ocean currents stay within the same hemisphere, and the DURACK et. al. paper showed that the heat accumulation occurred within the southern hemisphere then the energy stayed in the southern hemisphere. this is the second time that you have passed over this point, using distortion and then feigning ignorance to assert some kind of message. "I am not a scientist but. . ."
Even when you are shown that the TOA cannot be determined by satellites (as you asserted) you quote a single phrase that states an entirely different paper (which I read) that used some satellite input in their shortwave incidence radiation calculation, but since EVEN THE TITLE of their paper shows they used this input to develop a MODEL and did not use DIRECT MEASUREMENTS (as you said), your entire argument is deception and obfuscation. Again, I am sure you will simply claim ignorance. . .
790 - 515 - 100 -30 = 145 GtC remaining for a (conservative=risky) 66% chance to stay below 2 degrees. If we want to stay below 1.5 degrees and have a higher chance of staying below 2, then the budget is even smaller, essentially zero, as indeed David Spratt shows. So we don't have the luxury to reduce our emissions slowly, we have to do it as fast as possible. How fast is that? Maybe zero global (fossil fuel) emissions by 2050? And in the West zero emissions by 2040, with 40% reductions by 2020, as Denmark and Germany are trying to achieve? And negative emissions after 2050, as far as possible? That is so well put Jai, I enjoyed reading that. There are numerous examples of denialist misrepresentation, but the worst of all is when ones own position is misrepresented as then, rather than having something to rail against, one ends up deflated and let down. It's good to see that a lot of deceptive strategies are at play here, that suggests importance of the subject. Trying desperately to complicate simple things, as well as willfully making the dialog hyper–technical (so as to throw off any potential lurkers and make them feel it's boring or complicated) are but two such strategies. I'm sure we can pinpoint more in the new year summary. Scientists estimate that the trip from the North Atlantic to the deep water upwelling sites in the Pacific takes about 1,600 years. Relying on the close correspondence between hemispheric-scale ocean heat content and steric changes, we adjust the poorly constrained Southern Hemisphere observed warming estimates so that hemispheric ratios are consistent with the broad range of modelled results. These adjustments yield large increases (2.2–7.1 × 1022 J 35 yr−1) to current global upper-ocean heat content change estimates, and have important implications for sea level, the planetary energy budget and climate sensitivity assessments. Again, you appear to be arguing with disinformation. Please speak to the fact that the paper had to adjust up the southern hemisphere heat content but not the northern hemisphere heat content. It is not how long it takes the water to get from one end of the TCH to the other that matters - but rather the amount of heat flux that crosses the equator. And by this argument then the additional heat in the southern hemisphere can't be Co2 either, because that is global. If so, how much heat crosses the equator by ocean currents each year, on average? There are no emissions from any natural source whatsoever. RCPs have two modes - emissions driven in which human emissions only are specified and an earth system model is expected to work out all natural feedbacks and other changes in sources/sinks of carbon and presumably other GHGs. And concentrations driven scenarios in which the concentration of gases is fixed and the model does not make any modification to these concentrations based on calculations performed within the model. From 6.4.3.3 the earth system models are used to estimate the required the fossil fuel emissions to actually follow the RCP scenarios. I read this as further evidence that methane emissions from permafrost are included when specifying the RCP concentration driven scenarios. I think much of the confusion is that most of us expect that the IPCC would be following a bottom up approach - start with GHG emissions, work out GHG concentrations, work out forcings and finally work out the temperature change. IPCC seem to have actually started with a forcing - the scenarios are named after the target w/m2 for each scenario - 2.6, 4.5, 6 and 8.5. For each target an IAM model works out what emissions and resulting concentrations are required to meet this target. The IAM model is primarily an economic model and makes decisions such as how much money to invest in a particular mitigation technology. CMIP AOGM models are then run with the specified GHG forcings to calculate temperature change. The question then is whether the permafrost methane emissions absent or present from the IAM models. Given the IPCC discussion of specific methane emission amounts from this permafrost I would expect them to be there, but have not found direct evidence that they are. I don't know. Its your theory that not enough heat can move between the hemispheres to account for the difference, so I'm not working out the numbers for you. When you go look them up, don't forget to include the effect of the mass movement of air involved in the monsoon flowing from roughly 20N to 20S each year, and the regular movement of water from the subtropicals to the equator where it mixes and then is discharged to the subtropics again as part of the ENSO cycle. notice how you have now diverted the discussion away from Ocean heat content and top of atmosphere energy imbalances, satellite records and the final goal, effects of Durack et. al on ECS. this circular reasoning is characteristic of disinformation campaigns. The increase in GLOBAL CO2 forcing is balanced by INCREASED negative forcing of first and second order (cloud) aerosol feedbacks, the vast majority of which affect the northern hemisphere, as I state previously. and yet, you continue to disregard the issue regarding north/south energy deposition adjustments by Durack et. al. say it with me, increased CO2 and Methane contributions to positive forcing, balanced by Increased first and second order negative aerosol forcings, primarily acting on the northern hemisphere leading much higher likelihood of HIGHER ECS values. . . I will tell you right now, the amount of heat transport from the interhemispheric mass movement of the MOC is undetectable over the annual or even decadal periods we are discussing. It takes approximately 800 years for the water from the equator to reach the atlantic subduction zone, that's about 7 miles per year. Again, we are discussing the observed amount of ocean heat content gain in the southern oceans. but you still deny discussing this issue, instead deflecting with even more red herrings and diversions and outright lies (i.e. MOC as a heat transport between hemispheres). I understand your tactics and observe your disinformation. I see now that you are indeed a disinformer intent on polluting the forum. "how much heat crosses the equator by ocean currents each year, on average?" You see, one of the report's more powerful sections wound up being left out during last minute negotiations over the text in Copenhagen. And it was a section that, among other matters, tried to specify other measures that would indicate whether we are entering a danger zone of profound climate impact, and just how dramatic emissions cuts will have to be in order to avoid crossing that threshold. The dropped section in question appeared in an August 25, 2014 draft of the synthesis report, but not in the final version... would have comprised two pages in the final report, and was worked on by a team of scientists for nearly three years... listed climate change impacts of a magnitude that would constitute "reasons for concern," because they might imperil unique ecosystems or risk catastrophic one-off events like the collapse of global ice sheets. It also discussed what it would take to stabilize climate change in “sufficient” time to stave off these worst impacts. On this subject, the box stated that "rapid and deep emission reductions" would be required to keep global warming below 2 degrees Celsius. Indeed, it stated, the world can only emit about 1000 more gigatonnes of carbon dioxide (one gigatonne is equivalent to a billion tonnes) in the remainder of this century, adding that "at current rates, this remaining budget will be exhausted in the next 20 to 30 years." The box, he says, "was an attempt to compile the most relevant information from the report into one place." At the meeting, many delegates felt that the proposed language or alternative proposals for the wording of the box were unbalanced. In discussions among delegates and scientists it eventually proved impossible to find language that everyone could accept. The meeting concluded that a separate box was unnecessary given the wealth of relevant information throughout the report." Michael Oppenheimer, a climate scientist at Princeton who was also part of the core writing team, suggests that politics got in the way of the inclusion of this scientific information... the box explicitly stated that "risks of impacts pose particular challenges for the least developed countries and most vulnerable communities." Another reason this topic is "extremely sensitive," says van Ypersele, is that not everybody agrees that 2 degrees Celsius is even a safe threshold at all. Many think 1.5 degrees would be safer -- a number that would imply a much tighter global carbon budget and an even narrower window to avoid "dangerous" climate change. "I have a very strong view that scientists have a last word on what is in the report," says van Ypersele. "What they don’t have the last word on is what is not in the report." We are talking about heat transport from the southern hemisphere to the northern hemisphere, not from the equatorial regions to the polar regions. You make a statement about ocean heat flux, and I have my doubts about the accuracy of that statement. So I ask you a logical question, to find out what you base your statement on. You answer you don't know. So you just suppose your statement could be true, but it could be wrong as well. Apparently you have no interest in trying to find out if it's right or wrong. So indeed you only seem to argue one way, questioning the argument by others that Durack et al seems to imply higher ECS. It just doesn't make sense, except for trying to downplay the risks of global warming for one reason or another. Also on the remaining carbon budget you just don't respond to the arguments and references given. You seem smart enough, but not really willing to use your intelligence reasonably. Maybe I'm wrong, but that's how it seems to me for now. Or can you at least tell us what you think the remaining carbon budget is for having a good chance to stay below 2 or 1.5 degrees? And can you at least admit that since you don't know the magnitude of the ocean heat flux you refer to that Durack et al may imply a higher ECS? Indeed not important at all, only inconvenient, to some. Yes, let's just leave out the catastrophic little bits, shall we? more to the point it's about stocks and flows. Off the top of my head, so check my numbers, Durack(2014) estimates around 0.1 to 0.5 * 1e22 J/yr OHC underestimate in SHemis. there is no value on the page you posted that I can see, however it is simply a red herring distraction from the topic of discussion (ECS implications by Durack et. al). I am sure that if you multiply the flow rate of the MOC by the specific heat capacity and the delta temperature you will come up with a very small number since the flowrate is so slow. doh, or you may find it is about 1 petawatt of northerly transport. so the amount of heat transport is significant and significantly larger than the adjustments (by 2 orders of magnitude). In this point I was incorrect in my estimation of cross equitorial heat transport. however, as I said before, the values of heat accumulation in Durack et. al. stand independent (or rather, regardless of) heat transport across the equator. The issue isn't where this additional heat will end up, but rather, what caused the additional heat in the southern half of the planet (vs. the northern half). In my opinion there is no scientific backing for a target of 1.5 or 2. The only target I think the science justifies is 0. The carbon budget should be as low as possible. So any time anyone comes up for clear evidence that you are wrong, you just label it as a distraction? new argument - you are throwing out red herrings. Lastly I leave a thought - The increase in OHC for the southern hemisphere heat content is justified because a) it matches the CMIP 5 models better - in particular to achieve the balance of heat between SH and NH predicted by these models, b) it matches sea surface height better. "The only target I think the science justifies is 0." This, at least, we can agree upon. 3. Satelites have too high of measurement uncertainty to determine TOA so heat budget estimates rely on summations of individual components, in fact all three papers you referenced said as much. However, none of this matters because the issue is that the additional heat is added to the southern ocean which indicates an issue with aerosol forcing estimates. 4. can we please talk about impacts to ECS? the impact to the southern ocean is (potentially) derived by a significant underestimation of aerosol forcing values which would lead to higher ECS. rebuttal: heat in the southern oceans is not relevant because it doesn't remain there and can be moved around. 5. The entire point of Durack et. al. is to show a 35 year increase adjustment to the total ocean heat content in the southern hemisphere. Why do you keep bringing up statements that have no impact on the argument regarding ECS? and, YES! the methodology that they used relied on sea surface elevations! very good! But, may I ask once again, why is it that this doesn't impact ECS? Scientists often do err on what is (erroneously, I think) called the conservative side. The U.S. is Falling Further Beyond in Numerical Weather Prediction: Does the Obama Administration Care? However, now that i seem to have engaged, let me speak as a sometime and now and again scientist. You may judge how conservative I am. Every climate scientist I know (I do not know Prof Curry, or Dr. Pielke or others of that minority) is far more concerned about climate change than they state in their papers. Why ? Because they include in the paper only what they (think) they have proof of, and that which can be defended (a stronger term than "justified") in the peer reviewed arena. Outside that arena, in the popular press, their misgivings, are rarely voiced, due to the volume of vituperation directed at all those who dare, as you have seen in, for example, the case of Prof. Mann or Dr. Hansen. You may condemn them for lack of courage in the public agora, but I would strongly disagree with imputing a lack of scientific integrity to their peer reviewed work, as some here seem to do. There is a difference between the two. I personally do not blame those scientists reticent to evangelize the imminence of the danger, I would rather have them work on what they do best, and encourage a new breed of that dying species of science journalists who are trained in the language of the science. I confess frankly that I do not know how to do that last bit. 2)On another note, looking at merely TCR and ECS misses large aspects of anthropogenic climate impact. I think change and intensification of local precip patterns, enhanced GIS and AIS melt, and widespread trophic collapse of ecosystems will screw us long before we see 2C global surface temp increase above preindustrial. But that's just me. 3)I think we need a separate thread on OHC, and heat transport. Is there one already ? 3. Satelites have too high of measurement uncertainty to determine TOA so heat budget estimates rely on summations of individual components, in fact all three papers you referenced said as much. No the Church paper specifically says that the heat budget total is calculated as a combination of satellite observations of radiation, temperature history and modelling. None of the papers that I or anyone else has referenced state that the total heat budget is calculated by adding up the individual components. As I've said several times now. Well obviously if the rate of heat accumulation in the southern ocean is faster then the final temperature that the globe as a whole reaches at equilibrium must higher? I mean why would any logic be needed to explain that?? Indeed, so we agree on the risks and the argument is on (important) details in the science.